Romney or Obama: Who is worse for Russia? 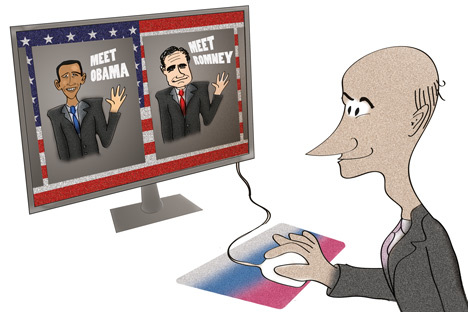 Do Russians prefer Romney or Obama? In fact, neither candidate excites Russians too much, due to the dwindling fascination with all things American, including the sacrosanct ritual of the American presidential election. Or perhaps I should not mention it. Russian public opinion, when it comes to the issue of Russia’s relations with Britain or with the United States, is often treated by the western media as immature. Twenty years after the collapse of Communism we are still treated as children growing up in a problematic family. Russians’ disenchantment with the US, when it transpires, is usually ascribed to the poisonous influences of state-owned television or some dirty trick of “Putin’s propaganda”. The only cure suggested for this sort of “childhood disease” is usually more exposure to the western media. It is presumed that such exposure is still lacking, despite numerous facts speaking against such a simplistic explanation. The growing penetration of the Russian market by western media giants can be cited, with Vedomosti daily, for example, being published in co-operation with The Wall Street Journal and the Financial Times, in fact becoming a Russian clone of these papers. But citing similar trends on the internet, radio and even television would be to no avail – again it is presumed that there cannot be too much western propaganda, just like there cannot be too little of Putin’s propaganda. However, it is a hard fact: during the past 20 years the US, the UK and other members of the European Union managed to do something that would have been unthinkable in the late Eighties, during the heyday of the West’s popularity in Russia: they managed to lose Russian public opinion. U.S. elections: are relations with Russia at stake? Great efforts had to be made to achieve such a result. Nato’s expansion, the bombing of Yugoslavia and several wars in the Middle East would probably not be enough to do the job, but Governor Romney’s characterisation of Russia as “our number one geopolitical foe” did it. It came on top of two decades of Russia’s concessions. It occurred even to the most die-hard Russian liberals of the Eighties mould that some western politicians can sometimes be not just duplicitous, but plain stupid. Dangerously stupid. Russia, while not being the epitome of democracy or economic prosperity, is certainly not a threat to the US. It is also not a threat to its neighbours. Georgian leader Mikheil Saakashvili’s constant talk about the Kremlin’s “aggressive” policies, for example, should raise doubts precisely because of its provocative nature. The neighbours of Stalin’s Soviet Union during the zenith of its power in the Forties and Fifties rarely talked about the Soviet dictator’s aggressive character for fear of provoking him and becoming his next victim. Potential aggressors are most often appeased, seldom provoked. In fact, this notorious Republican “inflexibility” with Moscow sometimes led to nice personal relations between the Soviet leaders and their American colleaguecounterparts. “Soviet leaders sometimes enjoyed the presence of Republicans in the White House, since the Grand Old Party’s tough rhetoric served as a perfect justification for more ideology and rearmament programmes inside the Soviet Union,” remembers Dimitry de Koshko, a veteran French writer on foreign policy issues who is currently working as a commentator for the Voice of Russia radio station. Instead of showing his concern about Mr Romney’s outlandish statement about “number one geopolitical foe”, Putin promptly thanked “Mitt” for this phrase since it allowed the Russian president to demonstrate to his people that a quickly developing American ABM programme in Europe could fall into “wrong hands.” In this situation, Putin did not want to make moral judgments, he behaved like a cold-blooded political player who takes advantage of his enemy’s wrong move. In fact, this could be the solution to a long-standing riddle. Here it is: why were Democratic candidates more popular with Russia’s simple folk (Kennedy and Roosevelt were the only fully positive figures even for the ultra-critical Soviet media), while Soviet leaders managed to get on better with hawkish Republicans? The answer to this question does not lie in Russia’s military weakness or strength (which Reagan presumably crushed). Under Stalin, America’s military superiority over Russia was muchmore obvious, but it did not lead to peace in the postwar years. The answer, as usual, is in perception. Candidates like Romney make Russians in Moscow and Syrians in Damascus feel like hostages. And every hostage dreams of a personal fortress – which the Soviet leaders promptly delivered. Putin is not this kind of person – Russia’s recent deal with BP shows how far he is from isolationism. But Romney’s mouth is just such a handy instrument: with him, you can “freeze” and “unfreeze” reform in a besieged fortress whenever you want it. Can a pragmatic statesman, like Putin, wish for anything more handy? And don’t the people of the US deserve someone more knowledgeable and less arrogant as their only alternative for a rather duplicitous Mr Obama? Dmitry Babich is a political analyst with the Voice of Russia radio station.